Sick of empty folders here and there? Don’t worry! 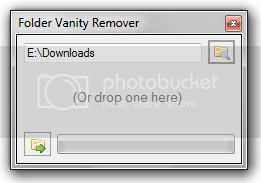 You can use a small app known as Folder Vanity Remover. It helps you to Delete Empty Folders in Windows 7. It’s a simple and light freeware that’s pretty easy to use. To delete empty folders in a particular directory simply select the directory and it will automatically scan and delete empty folders. Now, that’s easy enough to clear the clutter, isn’t it? As the app is simple, light and tiny there are no settings that you can play around with. Well, I don’t think you even need them.